I've been wanting to give this look a try for a while now but have been waiting for my stripping tapes to arrive. I knew they weren't going to arrive quickly as I ordered then from American but I was pretty disappointed when I received an email letting me know they'd just been dispatched 2 weeks after I'd placed the order! They then took another 2 weeks to arrive. 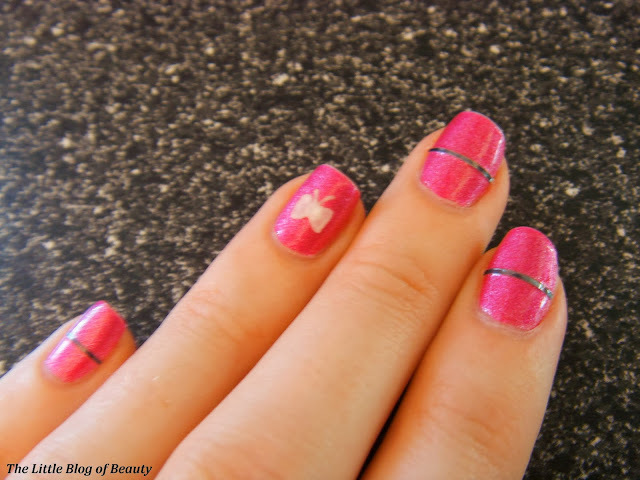 I've been looking for some bow nail decals or stickers for a while now for the bow for this design but I haven't been able to find any good ones, or ones that don't come in a set with a load of other designs that I don't really like so probably wouldn't use. I do did have a black nail art pen so I thought I would try drawing the bow on free hand but when I went to use the pen I discovered the nib has apparently broken and it just started continuously pumping out black varnish all over the place. So that was the end of that idea! The only other nail art pen I have at the moment is a white one so I had to resort to using to using that. I didn't want a white bow as the 'ribbon' is black but I don't think it looks too bad. If you know where I can get hold of some reasonably priced bows to use for this look please let me know. I wanted to use a base shade that was pretty and sparkly, like pretty wrapping paper, so I decided to go for Illamasqua's Seance which is a gorgeous shimmery pink. Apart from that I just used a strengthening base coat, Seche Vite top coat, black stripping tape and a white Joyme nail art pen. I know I may get shot down for mentioning Christmas as everyone seems to have gone Christmas crazy recently and it's only September but this would be a fab design to wear around Christmas time with Christmasy colours maybe in red and green or something like snowy silver and icy blue. What do you think of my gift wrap design? Great job these are really cute! Wow! These are beautiful. You're so talented at nail art. Lovely Blog.